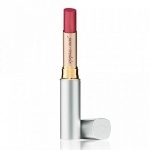 Jane Iredale Just Kissed Lip Plumper stimulates the production of collagen, increases lip hydration, reduces lip furrows and enhances the volume of the lips. Jane Iredale Just Kissed Lip Plumper is a beautiful tinted lip plumper with unique, time-released peptides designed to increase hydration. Ginger Root Extract stimulates blood circulation, making lips appear fuller. Shea Butter, Sunflower Oil and Avocado soften and hydrate. Essential Oils of Lemon and Tangerine exfoliate dead skin cells.